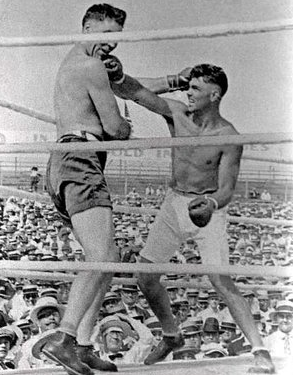 Jack Dempsey proved to be the greatest fighting tornado, in a boxing way, the game has ever known, when in nine minutes of actual combat today, he crushed Jess Willard into a shapeless man of gore and battered flesh. One minute and 58 seconds after the two men had squared away, Dempsey hooked a three-quarter left to the point of Willard’s jaw, and the champion sat down heavily with a dazed and foolish look, a simple half-smile crowning a mouth that twitched with pain and bewilderment. At the count of six, Willard rose slowly to his feet. Less than ten seconds later, another of Dempsey’s terrific hooks lifted the human mountain from his tottering base, and once again he crushed the sun-baked canvas with a thud that rolled forth the echo of his doom. Seven times in that first round Dempsey tore in and lifted the reeling, battered champion off his feet. Six times Willard slowly lifted his weary, broken frame back into position to receive once more a right or a left hook that snapped his bloody head to the back of his wilting spine. The big crowd, seeing Willard’s utter helplessness, failed to hear the bell in the wild uproar that followed. Dempsey started to crawl through the ropes as Willard was dragged to his corner, as one might drag a sack of oats. There was no expression on his face except the witless, faraway look that might belong to a simpleton who had just crawled out from under a rock crusher, wondering what it was all about. While the uproar was at its height Dempsey was hurriedly called back to the ring and the bloodless, pitiless drama went on to the second act. Twenty seconds after the second round opened Willard was a terrible wreck to behold. His right eye was completely closed, a big blue moon with a fringe of crimson protruding far beyond his face, with a gray, twitching slit where his eye once had been. Dempsey fought with all the necessary brutality of his craft. With the championship now in plain sight, with the goal of his dreams just at the end of another hook, with all the world before him at twenty-four—lifted from a tramp two years ago to a millionaire’s income ahead—he hooked those salvos of rights and lefts, shifting from Willard’s mutilated face to his quivering body, with only a few pauses between his deadly blows. After the first round Willard came back as a game man comes to meet his fate, as sure and as certain as death and the grave. Here and there he handed a few weak, faltering punches that failed to even check Dempsey’s rush; but in the main he spent his time glaring helplessly at his opponent out of his one undamaged eye and groping feebly to rest his great bulk upon the lighter man, not to wear him down, but to find a moment’s rest from the vast and utter weariness that was beginning to soak through his giant frame, deadening his nerve cells and moving slowly but steadily to his brain. At the end of the second round there was a question again as to whether Willard would answer the bell. But once again he lifted his bulk to reeling, tottering legs and stood to receive the rush of his successor who, without a moment’s delay, started the fountain of gore spurting again as Willard wearily turned his head to spit out clots of blood upon the canvas. It was easy to see in the middle of the third round that the conqueror of Jack Johnson would never answer another bell. For, in the meanwhile, the right side of his face had swollen to unbelievable proportions. The flesh there had been so badly cut and jabbed and mashed by Dempsey’s terrific hitting force that purple blotches began to intermingle with the red. If you could imagine a thick hamburger steak, painted blue and purple and crimson, plastered to the side of a man’s face, you might get some idea of how Willard looked in the middle of that third round. If a six-inch shell had exploded against his right jaw it could hardly have changed his features more. No dreams came to him of a vanishing title. He knew no anguish of fading glory. With glossy, rolling eye and a foolish, twisted face he reeled along his way to oblivion. The endless punishment he had received had first deadened his nerve cells and shut off all electricity that runs the human system. The deadening growth had moved to the brain, so that in the closing minutes of the fight he had no sign of intelligence left. He stood or reeled without any sign of comprehension displayed over his face—if you’d care to call something a face that some time before had lost any resemblance to anything human or to anything even belonging to the wild. The wonder is that his vast system had enough vitality to carry that much punishment and still stay up. For after the first round Dempsey scored no further knockdowns, unless two are so registered where Willard crumpled against the ropes and hung there like a side of beef on display in a butcher shop. No other man could have taken that much punishment and lived. If there was any pity in the prize ring (which there isn’t) it might have found expression here where this man once known as the physical marvel of the ring—this man who five minutes before had stood with a bold and confident look as champion of the world, trained to the day, as fit as he could ever hope to be—now stood as an open target for an opponent nearly fifty pounds lighter and six inches shorter in stature—a target that rocked and swayed under the blistering sun while 50,000 looked on and waited for the coming end. As time was called for the third round there was no need of Walter Monahan’s sponge to announce that Jess had closed his engagement as champion of the world and that Jack Dempsey now wore that crown that had belonged in turn to Sullivan, Corbett, Fitzsimmons, Jeffries, Johnson and Willard. And Dempsey had proved to be the most spectacular champion of them all. It had taken Corbett twenty-one rounds to knock out Sullivan. It had taken Fitzsimmons fourteen rounds to drop Corbett. Jeffries had needed eleven rounds to crush Fitz. Johnson travelled fifteen rounds to blog out Jeff, and Johnson lasted twenty-six rounds against Willard. But Dempsey, with the crushing force and the blazing speed, in those punishing hooks, delivered with either fist, needed no such leeway. Only a matter of a few seconds saved Willard a one-round knockout for, if the bell had known a second’s delay, Dempsey would have drawn another one-round verdict to add to his amazing list of one-round affairs. How Willard ever stayed on his feet after the fusilade of that first round will ever remain one of the mysteries of the game. Doughboys have taken a .45 bullet into their bodies and still rushed forward for one last trench knife blow. You may recall how Fuzzy-Wuzzy, in Kipling’s verse, soaked up British fire and still broke a British square. But here was a man who through the last six minutes of the battle stood up to take an almost countless flurry of punches from a man who had already shown he was the hardest hitter the fighting game had ever known. It was unbelievable. From less than ten feet away we looked on and refused to credit the vision of our eyes. It looked as if every punch must tear away his head, but in place of this the fountain continued to gush, the features continued to swell, the raw meat continued to pop open in deep slits as the red surf rolled from his shaking pulp-smashed frontispiece. If Willard had not been in wonderful shape he would have been killed. He surely would never have answered the bell for the second round. Dempsey left the ring unmarked. He had planted his nerve-killing blow before Willard had ever found opportunity to test the hitting power of his long, tremendous arms. Where was the famous uppercut? No one will ever know, for before the Kansan had a chance to test either, his motive power was paralyzed and he needed every ounce of vitality left to keep him on his feet. And how this Dempsey can hit! No wonder Carl Morris and Fred Fulton and so many others crumpled up before his blows. When he hit Willard it was exactly the same as if some strong man had swung upon the ex-champion with a heavy hammer. It felt as if raw steel had broken through his skull. He fell before a man who must be able to hit harder than any man who ever lived. And so, as Willard at thirty-eight passed out, Dempsey at twenty-four becomes champion of the world. The champion boxer—not the champion fighter. For it would be an insult to every doughboy that took his heavy pack through the mules’ train to front line trenches to go over the top at dawn to refer to Dempsey as a fighting man. If he had been a fighting man, he would have been in khaki when at twenty-two he had no other responsibilities in the world except to protect his own hide. So let us have no illusions about our new heavyweight champion. He is a marvel in the ring, the greatest boxing or the greatest hitting machine even the old timers here have ever seen. But he isn’t the world’s champion fighter. Not by a margin of 50,000,000 men who either stood, or were ready to stand the test of cold steel and exploding shell for anything from six cents to a dollar a day. It would be an insult to every young American who sleeps today from Flanders to Lorraine, and from the Somme to the Argonne, to crown Dempsey with the laurels of fighting courage. He missed the big chance of his life to prove his own manhood before his own soul—but before that he stands as the ring marvel of the century, a puncher who will be unbeatable as long as he desires to stay off the primrose way and maintain the wonderful vitality of a wonderful human system.